Knee braces have been used for decades to expedite the healing process as well as to prevent future injury. If you have recently injured your knee or have been noticing pains, aches or the like, a knee brace can reduce pain, increase mobility, and provide additional support. Selecting the appropriate knee brace for your individual problem can be a bit confusing. There are many different types of knee braces, all for different issues. It’s important to do your research, understand your condition, and consult your doctor before deciding on a knee brace. If you’re looking to buy a medical knee brace, it’s good to a keep few important aspects in mind. What part of the knee are you trying to protect? From MCL and ACL tear braces to patella stabilizers, different braces aid different parts of the knee. A dislocated knee cap, for example, requires entirely different brace system than a torn ligament or arthritic joints. Likewise, there are several tendons and ligaments in the knee that are prone to tearing, all of which require a specific type of support during rehabilitation. It is critical to pinpoint the underlying issue or issues behind your knee pain and select a medical knee brace accordingly. Once a doctor diagnoses what part or parts of the knee is the underlying source of the problem, you can begin finding the proper brace. What is the extent of your activity? The nature of your daily activities should play a big role in the brace your decide for yourself. A high impact basketball player requires a completely different brace than an individual who suffers from day-to-day osteoarthritis. There are two main categories of knee braces: Prophylactic and functional. Prophylactic knee braces are those used by individuals, mostly athletes, strictly for injury prevention. These users have not necessarily incurred injuries in the past, but hope to avoid them by keeping the knee properly supported. These braces are particularly popular with professional football players. They are usually made of elastic and are simpler in nature. These braces allow regular mobility and knee movement as well as breathable, comfortable material. These may include a pull-on sleeve made from neoprene that holds the knee tightly and insulates warmth that increases blood supply to the knee. Functional knee braces are braces used by those that have indeed incurred a ligament injury and are in a recuperative phase. In this case, functional knee braces should be worn in a conjoined physical therapy program that includes knee strengthening and muscle development. Functional knee braces are frequently hinged. Hinged knee braces are more "heavy duty" than standard prophylactic braces and offer more support and stability. These braces are used for lateral (outside of knee joint), medial (inner side of knee joint), or ACL injury (anterior cruciate ligament). Arthritis braces are also popularly known as unloader knee braces. Unloader or OA braces are another type of functional brace that serve to relieve the stress and pain of the knee caused by arthritis. 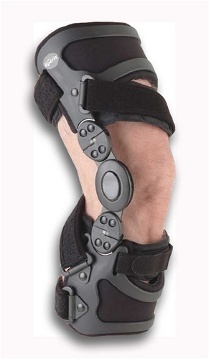 This brace is typically made from plastic or foam and contains metal parts that limit the range of motion to the wearer. These movement limitations ensure that the knee is kept in place. In addition to controlling movement, unloader braces add pressure to the affected area shifting the pressure and stress from the painful part of the knee to a healthier, less painful one. Changes from using an unloader brace are generally displayed by angular changes, bone spur formation decreased cartilage, and joint space narrowing. So whether you just incurred a knee injury, have been suffering from arthritic knee problems for some time, or just wish to prevent knee injury in the future, a knee brace may be just what you’re looking for. But remember, always consult a medical professional that understands your knee pain before buying a brace for yourself. About MMAR Medical: MMAR Medical Group Inc. is a premier supplier of high quality medical products including a wide selection of orthopedic braces. MMAR Medical specializes in medical knee braces, including unloader OA knee braces and sports and post operative ACL braces.